It's 49 degrees and sunny this morning but there's a big cloud bank off to the south. Hopefully it will stay south while we head north. We were going to head for Crater Lake today but reports are that it's gotten pretty cold around there and they could get some snow if it starts to rain in the next day or two. We decided that we'll save that sight for another trip. We will head north to the Bend, Oregon area to see what's there. Today we had just a short three and a half hour day of driving through more sage brush and rolling hills. We started to finally get into more trees and see some mountains off in the distance. We are anxious to get back into more mountainous country. 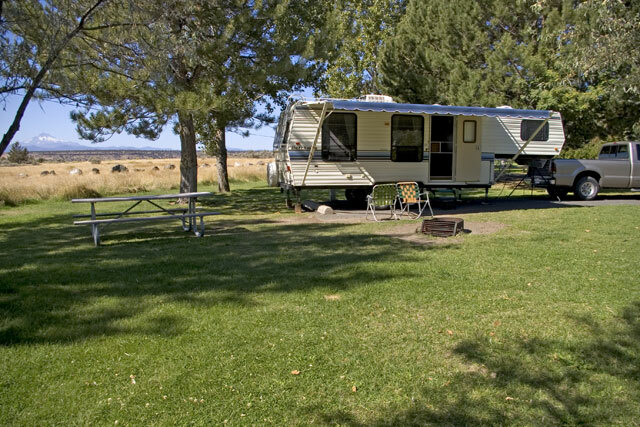 We found a campground just north of Redmond, Oregon that is well off the beaten path and really quite beautiful. The Cove Palisades State Park is down near the Crooked Canyon which is a deep straight edged canyon. We have a clear view of Mt. Jefferson across a golden field of what looks like wheat but it's not. The campground has water and power at each site. They are large sites and lots of green grass. The showers are centrally located which is convenient for us since we are located near the middle. This time of year there are not very many other campers here which is nice too. We like the place so much that we've decided to stay two nights and tour around the area tomorrow. Today sort of felt like our first real day of vacation, we had an easy drive and just took it easy the rest of the day. We sat around and took pictures and read books.